The IP202S is a single-wide industry pack (IP) function generator that provides a signal output that can sweep through a frequency range at a programmable slew rate. The output signal can be a sine, square, triangle, or sawtooth waveform up to 1 MHz and may be direct or transformer coupled. Signal amplitude and offset level can also vary with frequency. 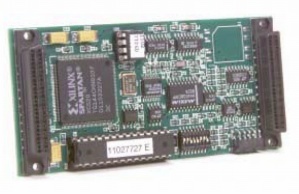 The IP202S can be used with any conforming industry pack carrier, such as carriers for VME/VXI, PC-AT, PCI, or NUBus.